It's a cold winter night and you're craving lasagna. The trouble is, there will only be two people eating it and you don't want leftovers for days. Enter: skillet lasagna! With four servings, this is the perfect recipe when you don't need to feed a crowd. Umami-rich mushrooms take the place of half the sausage in the tomato ragu, making it a little lighter than traditional meat-heavy recipes. Using no-cook lasagna noodles also means it's ready in under an hour. Best served with plenty of garlic bread to soak up the sauce and a a dry Italian red wine. You can easily make this a vegetarian lasagna by omitting the sausage and using one full pound of portabella, cremini or shiitake mushrooms in its place. Thanks to the meaty flavor of the mushrooms, you'll never even miss the pork, but add a little extra oregano and garlic to make up for the lack of Italian seasoning. Per Serving: 662 calories; 46g fat; 18.8g carbohydrates; 42g protein; 118mg cholesterol; 1752mg sodium. Amazing how much better it tastes when you have fewer dishes to cleanup! For my vegetarian husband, I used veggie grounds in place of the sausage and bumped up the garlic and spices to make up for the sausage seasoning. The mushrooms really packed in some meaty texture, especially using Portabellos. Very satisfying! 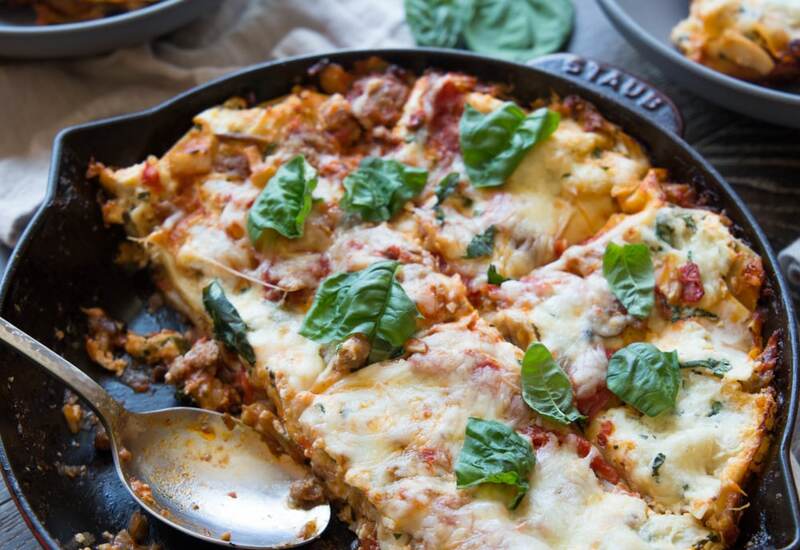 This skillet lasagna is so yummy! It's super easy to build in the cast iron. There's so much flavor and it's so filling. One of my favorite comfort food recipes!